It is important to determine whether or not a horse needs worming in the summer months. Many horses will not require treatment and unnecessary treatment could contribute to the development of worm resistance. Equally if a horse that requires worming is not treated, this could lead to intestinal damage, colic and infect the pasture of the other horses. A faecal worm egg count (FEC) should be used to assess the roundworm burden during the summer grazing season. Your vet or SQP will be able to advise you on whether your horse requires worming; usually horses with a FEC of >200 epg are treated. Direction – using the right wormer drug. The number of different wormers available for horses can be confusing. These can be divided into three groups: benzimidazoles, such as fenbendazole, tetrahydropyrimidines such as pyrantel and the macrocyclic lactones which include moxidectin and ivermectin. As moxidectin remains the only effective treatment for encysted redworms in many areas of the UK, many experts feel that the use of moxidectin should be preserved for a single annual treatment in the winter to remove inhibited redworm larvae. Where possible the other available wormers such as ivermectin, pyrantel and fenbendazole should be used throughout the rest of the year, when required. These wormers should also be rotated on an annual basis to limit the development of resistance to one particular drug. Reliance on drugs for worm control can be drastically reduced if sufficient attention is given to pasture and horse management. This not only makes worming more cost effective, but also helps to prevent resistance developing. 3. Do co-graze horses with sheep or cattle, these will act as biological vacuum cleaners as they ingest equine nematode larvae. Equine worms will not develop into adults in sheep and cattle so this will drastically reduce pasture contamination. 5. Do keep young horses grazing separately from older horses. 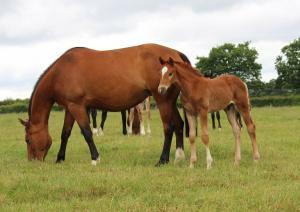 Young horses are likely to have the highest parasite burdens and be responsible for the majority of pasture contamination. During the spring and autumn months, worming for tapeworm is also recommended. Tapeworm infestation will not be picked up by routine faecal egg counts. There are alternative tests available, such as a blood or saliva tests, however, the tests cannot differentiate current infection from previous exposure (over recent weeks to months). Praziquantel or a double dose of pyrantel are the only available drugs that treat equine tapeworm. Some modern wormers conveniently combine praziquantel with other worming drugs such as ivermectin e.g. Equimax®, providing a combined wormer that treats all major types of horse worms. In each syringe of wormer there is approximately one or two teaspoons of paste containing the total dose of the active ingredient. Any ‘spit-out’ can represent a significant volume of the overall dose being lost and horses receiving incorrect doses. Under-dosing has several consequences; firstly, the product will not work as it should and secondly, it can contribute to the rapid development of resistant worms. There are alternatives to deliver the correct wormer dose, use an ergonomic easy to handle robust syringe or, if your horse is difficult to worm with a syringe, wormer is available in a tablet form that can be simply added to the feed to take the stress out of worming.